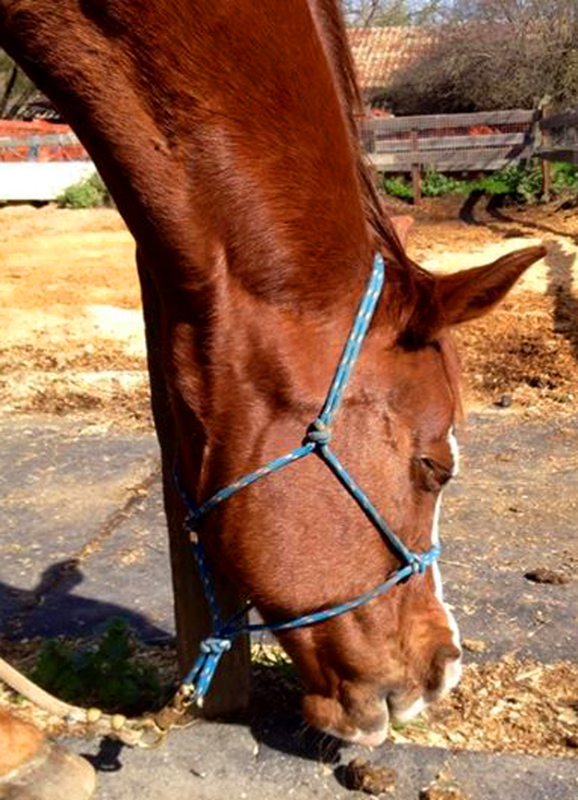 Cheyenne is a spicy, extremely intelligent Quarter Horse mare owned by Susan O. She is a great communicator and very exacting. Did I say EXACTING!? She will tell you very specifically, and in no uncertain terms what she likes and does not like and what she will take. What a great teacher! First Session she was a bit resistant and questioning at the beginning. Before our Second Session I found Susan & Cheyenne in the ring doing Free Play and Cheyenne broke from what she was doing and trotted up to say ‘hello’ with a nuzzle! 🙂 With Cheyenne I started by bringing in my Spirit Helpers (who always do the work – while I act as channel). Then start the On-hands Energy Work and incorporate the wonderful Masterson Method Integrative Performance Bodywork (developed by Jim Masterson) that I am working towards my certification in. And Cheyenne isn’t even one of my Case Studies yet! She should be because she is an amazing teacher! The following are some very detailed observations by Cheyenne’s owner Susan O. She was a keen observer and photographer too! 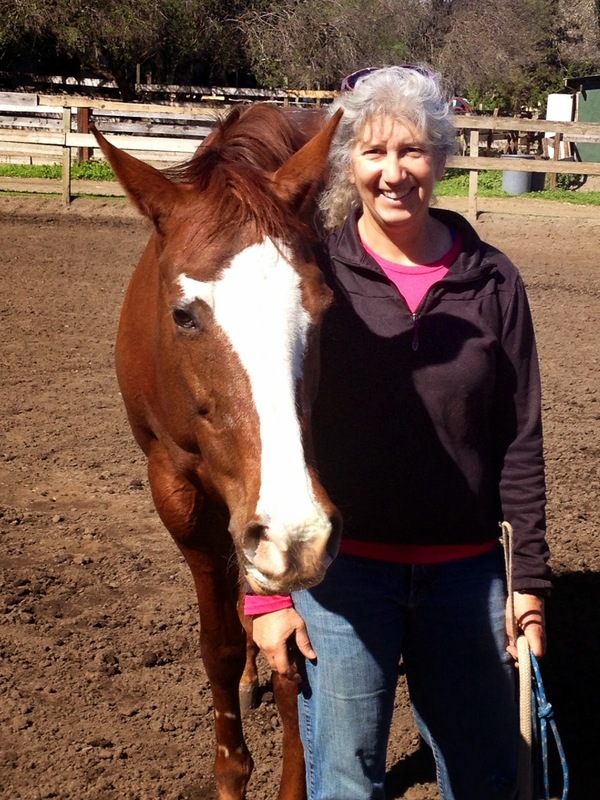 “I am very impressed with Karen’s gentleness and her ability to work with a reactive horse. She is able to keep herself safe by performing the healing work with her hands off of the horse and/or from many feet away. In addition, she is able to add in some small physical manipulations to help with tight areas. Her many tools allow her work to be very effective. 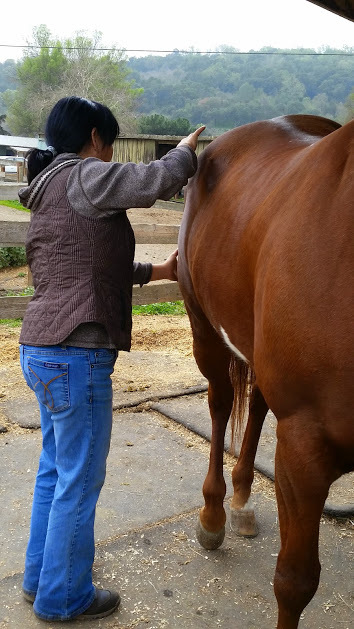 I also appreciate that Karen can work on the whole horse as well as spend more time in a specific areas of pain/tension. I knew that Cheyenne had pain in her left front, but I did not know about the other areas of pain that Karen found. I am very grateful to Karen for helping Cheyenne release tension and pain. Thanks again for a wonderful healing session.” Susan O. “It was interesting to watch Karen do a body scan of Cheyenne. Without physically touching her, Karen ran her hands 2 inches away from Cheyenne’s body to feel her energy. When she passed over an area that had pain or tension, Karen held her hand there to check Cheyennne’s pain/tension level and would tell me where she was feeling pain, how much pain she was feeling, and whether it felt like muscular pain, joint pain, or an issue such as (e.g. digestive issues). After the body scan, Karen started the healing process. She started at the head and lightly rested her hands in two different places. Cheyenne gave some fairly typical responses that I have seen her give during past sessions with other healing modalities. At first, she said OK, and then she pulled her head away when it was too much. Karen was gentle and explained that she was helping her and tried again. 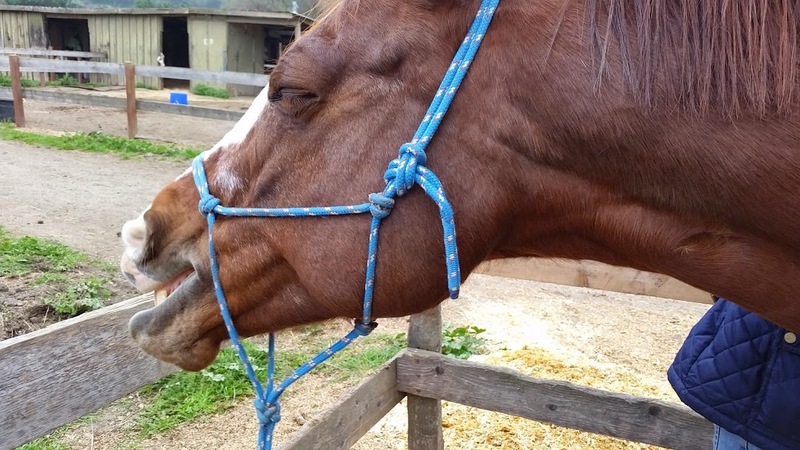 After 2 or 3 times like this, Cheyenne would eventually release the tension dropping her head and blinking and closing her eyes 1/2 way or all the way. 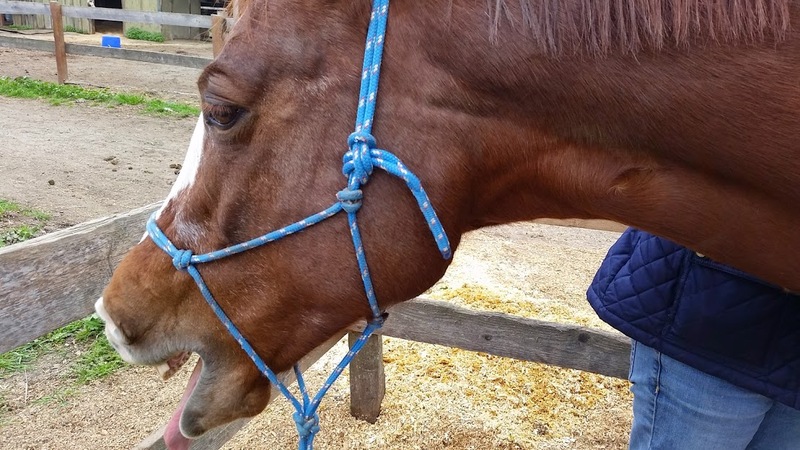 Karen had mentioned that before a horse releases oftentimes they will fidget or even try to leave, and that she would simply stay with Cheyenne, no pressure applied, but stay through her processing. In some areas, Cheyenne would accept the work right away and have a soft face, loose lower lip, closed eyes, lick and chew, blow out, and we got a big yawn. In one place when Karen’s hand was at her chest, Cheyenne turned her head and snapped at Karen. Too much! I don’t know if the energy flow hurt, brought up emotional issues, or required Cheyenne to release tension that she always holds, but I think it wasn’t comfortable emotionally and possibly physically. The chest area was one of the spots where earlier during the body scan Karen had said that there was some pain and tension. Karen again explained that she was here to help Cheyenne, and to me she added that she was only touching the skin with no pressure – but even that can often be too much too when the horse is painful physically/emotionally there). If Karen wasn’t able to touch Cheyenne to heal, she would hold her hands off of Cheyenne and still apply the energy. Cheyenne could still feel the energy but maybe it was less intense and she could receive it better. After Karen worked Cheyenne’s chest, the area where Cheyenne had snapped at Karen, she released with a big yawn. Wow! How wonderful. This area has always had a lot of tension for Cheyenne. afterwards, Cheyenne let out a few prolonged expressive Snoooooorrrttts! 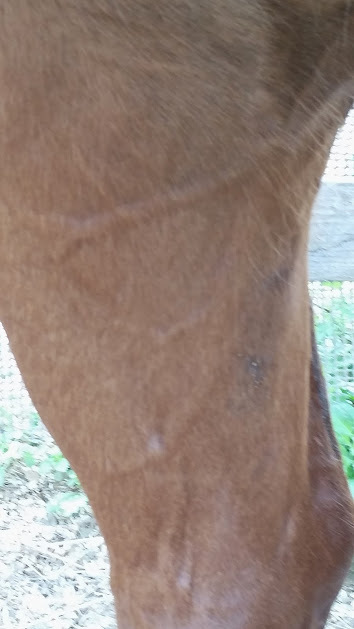 where the body scan had indicated a fair amount of tension/pain – the blood vessels in Cheyenne’s right hind leg started popping out like they do when she has done a lot of work (trails or other riding). The blood flow through that was definitely coursing through while we were just standing there with Karen applying her healing energy. Cheyenne let know when she had had enough work in that area by kicking out. Karen worked a short bit more on her hind end hands not touching her and saw that Cheyenne was done and we concluded the session. I’m looking forward to seeing what that area feels like the next time around. Perhaps the channels of communication have been opened up, some tension released, and the next time Karen comes, she will be able to release some more tension. By the time Karen was half-way through, Cheyenne’s nostrils were huge! They were both so round and open. She was hugely relaxed. Karen also pointed out that the shimmering/twitching on the outside of Cheyenne’s nostrils looked like the energy that Karen was feeling come out of her hands — a shimmering/twitching feeling. At the end of the healing session, Cheyenne was calm, gentle, and relaxed. Her nostrils continued to be wide open. I am looking forward to observing how the tension release and healing manifests in her behavior and motion. Thank you Karen for a wonderfully beautiful session. I look forward to the next one.” Susan O. “When Karen came for her second session with Cheyenne, Cheyenne was super ready and open to receive the work and focused on Karen even before Karen “started” the session. I had asked Cheyenne to walk away from her food and come to Karen. She did that readily, and just focused on Karen without any thoughts of heading back to her food. Karen said that Cheyenne seemed much more willing to receive the energy this time. She was a little resistant last time, but this time, she was ready and willing. I could really see the difference. Cheyenne immediately relaxed and started processing the work. She could barely keep her eyes open. She blinked a lot, closed her eyes, breathed out, and stood still. Karen told me she usually receives the energy with left hand and give healing energy with the other. After she was done with one pass, Cheyenne passed gas and then pooped. That’s a release! When Karen worked on Cheyenne’s heart area this time, she told Cheyenne that she would not touch her. Cheyenne was much more willing this time to have work there. Karen said that the energy felt spiky so she smoothed out that area. pawing – so it was clear that she was working through something while she was pawing. When she was done pawing, Cheyenne released with eyes rolling, blowing out, and a few big yawns. How interesting! 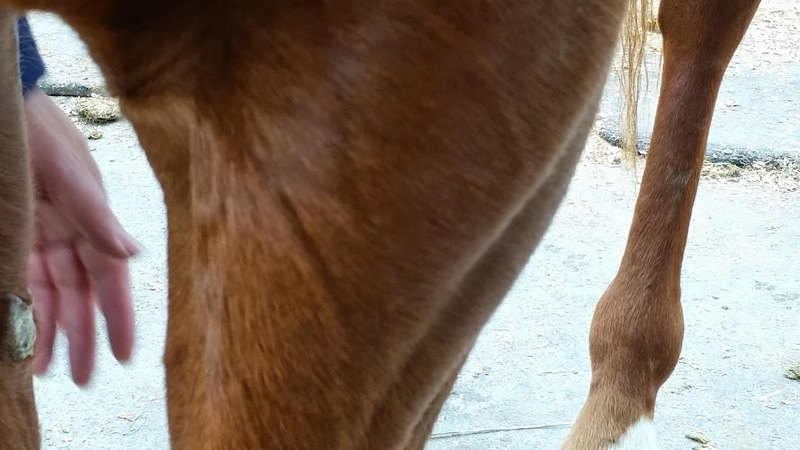 Karen was unable to work on Cheyenne’s rear legs by starting underneath her tail. She was reactive to that area (again). Instead, Karen started at the bottom of the legs rather than at the top of the hips/tail. She physically positioned Cheyenne into a stretch by cocking Cheyenne’s right rear leg and placing it slightly behind. Then, Karen did some energy work on her hips. Cheyenne relaxed into that work with closed eyes. At some point, Cheyenne, uncocked her right leg and cocked the rear left into the same position except that it was even with (instead of behind) the right leg. Karen moved over to Cheyenne’s left side and worked on her hip. Karen did not readjust the location of the left hind leg in this session. After a few minutes, Cheyenne readjusted again by uncocking the left rear and cocking the right rear. Karen moved again to the right side. It was super interesting to see Cheyenne change her body in response to the work and literally tell Karen when she needed the other side done. Karen moved on to a stretch for Cheyenne’s front legs. Karen lifted Cheyenne’s right front hoof and asked Cheyenne to relax her shoulder and place the right front behind in order to get a nice stretch. That exercise was difficult for Cheyenne. Karen said that she is tight in the chest. When Karen tried the same exercise on the left side, Cheyenne was very reactive, turning her neck and snapping at Karen. After a few moves, Karen went back to the right side and repeated everything. When she returned to the left side, Cheyenne was more agreeable. It was clearly difficult for her, but she allowed the stretch. And, at the end, let out multiple enormous yawns that took a while to unroll. What a huge release! Karen spent a bit of time working on the hind end from that distance. It was clear that Cheyenne was focused on the work and relaxing and releasing into it. At the very end, Karen worked on Cheyenne’s front left leg where she has been off for a few weeks. She said that she felt pain at the medial/posterior “knee” just below the joint and also on the tendon. She spent some there until the pain was greatly diminished. At one point, Karen felt pain in Cheyenne’s heels and hoof, so she asked Cheyenne if she wanted Karen to work on her feet. Shortly thereafter, Cheyenne lifted up her leg for Karen. Wow! That was a “yes” answer for sure. After we were all done, Cheyenne peed and a little bit later went to sleep to continue processing. Karen and I discussed the next steps. Karen felt that she’d like to have another session to work more on Cheyenne’s rear end as it is still reactive to receiving the work. We saw a marked improvement in Cheyenne’s receptiveness and releases this time to areas that had been worked the previous time. I imagine that the same receptiveness and release will happen on the rear end over time. 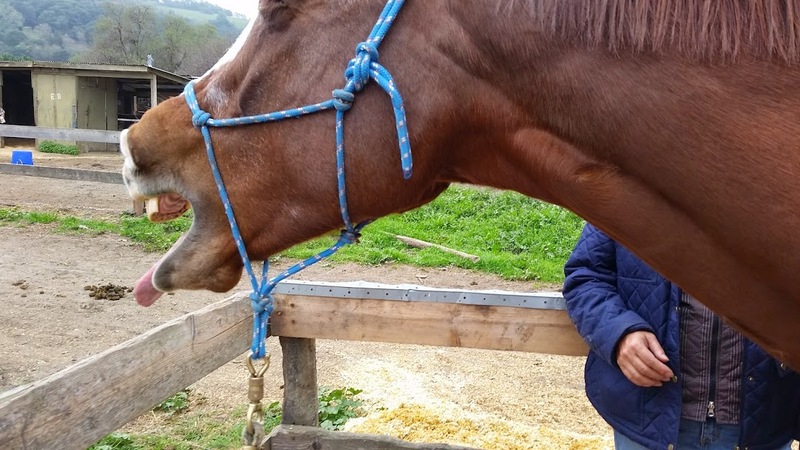 I am very impressed with Karen’s gentleness and her ability to work with a reactive horse. She is able to work close in & at a distance by performing the healing work with her hands off of the horse and/or from many feet away. In addition, she is able to add in some small physical manipulations to help with tight areas. Her many tools allow her work to be very effective. I also appreciate that Karen can work on the whole horse as well as spend more time in a specific areas of pain/tension. I knew that Cheyenne had pain in her left front, but I did not know about the other areas of pain that Karen found. 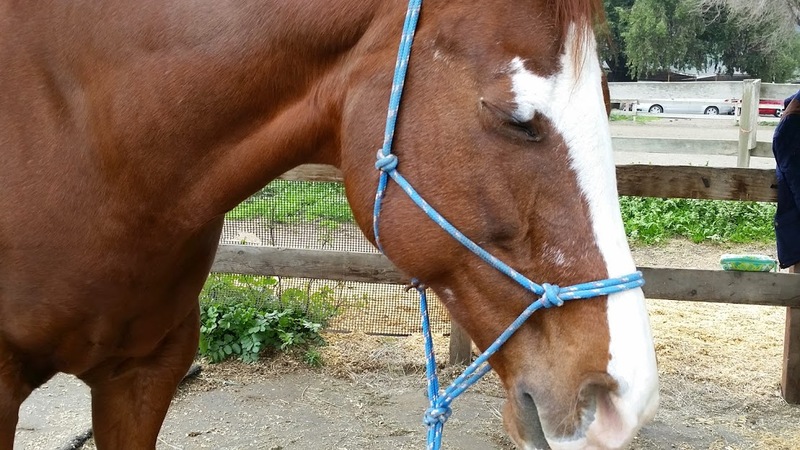 I am very grateful to Karen for helping Cheyenne release tension and pain. Session 3: Cheyenne says ‘Thank You’!!! Susan documented our sessions in detail and I am very thankful for her sharing her photos, video and observations with me. all photos & videos of Cheyenne are by Susan Osofsky. Thank You Susan!